One of the exchange websites that we will be looking into today is called Bitit.io. Their façade talks about instant, easy and secure crypto purchases. 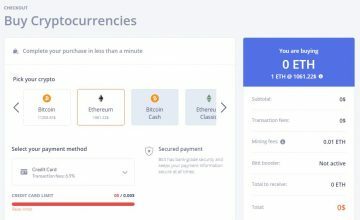 Here customers are able to purchase either BTC or ETH with the use of EUR, USD, CNY, AUD, and a lot more! We will be looking into their website and know their features, create an account and know their verification levels (if they have one) and know their website works in general. Without further delay, let’s talk about that! Of course, a review is better with a little bit of background information about a company. Bitit.io was founded in 2015 with the vision of providing cryptocurrency to even the most remote parts of the world. The company is based in Partis, France and their office is located at 25 Rue du Petit-Musc, 75004 Paris, France. What’s great about them is that they posted their office’s physical address which is great since you know you are dealing with a company that really exists and not just something taking up internet space. The website Bitit.io is not licensed but follows KYC and AML regulations. This is great since within Europe alone there have been billions of laundered money going through their financial systems making it a need for their companies to provide proper regulations to provide better services and overall safety. It is really important to know something about a website that you will be doing financial transactions with to make sure that you are doing business with a legit company. Now that we’ve looked into that, why not create an account with them? On the upper right-hand side corner of their website, you will be able to locate their “Sign Up” button. 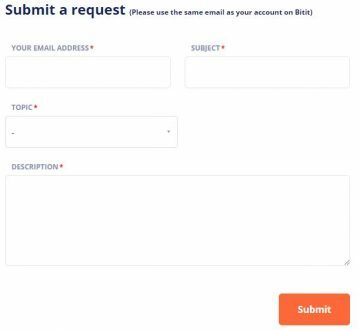 To create an account with Bitit.io all you need to provide is your complete name, active email address, and password for your account. After providing the needed information, you will be redirected to a different page asking for your date of birth, physical address, and phone number. If you do not want to create an account with them yet with the fear of exposing your personal information, we suggest you not to do so if you haven’t read this review yet. What about anonymity? Say goodbye to anonymity since they will be asking for your phone number and physical address. But no worries! We will be providing you guys’ screenshots on the website to make it easier for you to decide to go with them or not even without going through the processes yourself. Do they have a verification process to start transacting with them? They do have limits on which payment options you can use for their services. With the account we have (standard) where we just provided an active email address and mobile number, we are unable to transact with them using the Credit Card option. We are however able to pay for the crypto we want to purchase using Cash Vouchers and Wire Transfer options with different fees which will be discussed later in this review. Transacting with a credit card is simply the most convenient way to get your hands on crypto! And to be able to do that here in Bitit.io you need to Raise your limits daily from zero to EUR 700 per week (for credit card) and EUR 2000 per week if you choose the cash transactions which can be done by providing a proof of identity (a government issued ID) and a picture of you holding your government issued ID with a dated piece of paper saying “Bitit” for verification purposes. But what if you just want to use a standard account, what do you get from it? For credit card transactions you get zero access to it before you provide ID proof. On the other hand, cash vouchers and wire transfers will have a daily limit of $180.00. If you just want a website wherein you are able to purchase around $180.00 per day then this website will be perfect for you. Now that we’ve talked about their verification levels, what features do they have waiting for us? One of the interesting things that we noticed is that you will be able to add several BTC/crypto wallets with the ability to name each one and personalize it. This is great since some people will have multiple BTC wallets and have the ability to label each wallet will make it easier for you to withdraw or deposit from the correct one without any problems at all. 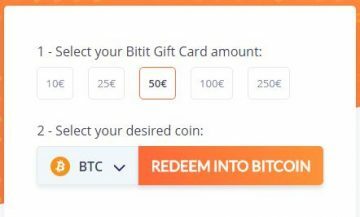 Next on the list will be the Bitit.io Gift Card wherein people are able to purchase the card with denominations of 10, 25, 50, 100, and 250 Euros. The gift card can be bought by one of their partners ma-carte-cadeau.com, avangarde.co, and thegoodgift.co and have it delivered to your doorstep. Gift Card cryptocurrency is great if you want to give them as presents to someone you know or you just want to have a cryptocurrency stored offline until you want to use them. Aside from the mentioned websites above, people are also able to purchase physical prepaid cards Neosurf and Cashlib with the use of their “Buy near you” tab located on their main website page (with a logged in account) or simply click this link to see the feature. Basically what this does is it helps you find the nearest physical store near you and pay for the voucher in cash, how easy is that? Two-Factor Authentication is enabled on the website making it safer for people to transact online. 2FA has become one of the things that we need to make sure exists since it’s really important to have this installed in your online financial accounts. How do you activate 2FA with Bitit.io? Compared to other websites wherein you just need to click a few buttons to have it turned on, here you need to download the Google Authenticator App and follow the steps instructed here. Now comes the most interesting part of the website! Here at Bitit.io users are unable to sell their crypto but only purchase it from them. If we take it into a technical perspective, this is simply a website that provides exchange services for your Fiat currency. With that being confirmed, how do we buy crypto from Bitit.io? Simply log into your account and head over to your account dashboard. On the upper part of the dashboard, you will see several tabs and one of that tab is called “Buy” with a coin logo. Click the tab and you will be redirected to the checkout page. On the checkout page, users are able to choose from BTC, ETH, BCH, ETC, LTC, NEO, XRP, and XMR making it one of the largest exchanges today offering more than just a couple of choice for you to choose from. It’s really straightforward since you do not need to spend time waiting for your order to be fulfilled since there’s no trading platform wherein people need to take your orders before crypto is transferred to your account. Fees here at Bitit.io are completely dependent on what payment method you decide to go with. Different vouchers have different transaction fees. 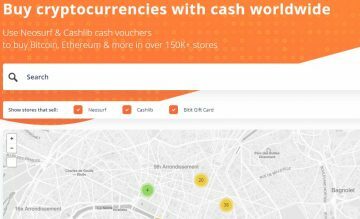 For Cashlib and Neosurf the transaction fee is at 11.9%, Bitit Card transaction fee is at 5.9%, Wire transfers will cost you 3%, and credit card transactions are charged 6.9% per transaction on top of their regular crypto prices. Compared to a lot of exchange websites today, they are definitely part of the few ones that are high on the fees but provide a lot of payment alternatives to make it easier for you to purchase crypto on their website. 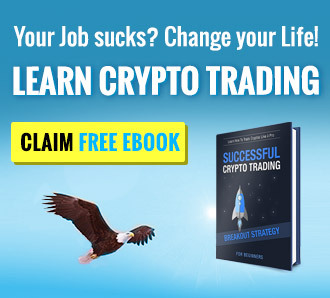 Since the website works as a straightforward exchange, people would not be able to deposit money into their account since they are basically buying crypto instantly and not going to a trading platform. Mentioned earlier in this review, we have shown you guys that the payment options are credit cards, wire transfer, and cash vouchers. Are you able to purchase crypto with crypto? Unfortunately, that does not work on this website since they only provide a crypto wallet for your withdrawals. Talking about withdrawals, it’s really easy to withdraw your purchased crypto to your personal wallet. On the lower part of the checkout page, you will be able to add a delivery address for the funds to be directly credited at. With this feature, it is easier and faster to just log in and log out of your account and complete the transaction without any delays. Here at Bitit.io, they offer a “Help” window for all your concerns that involve your account but they do not have any live chat/phone support to contact if you need immediate attention. Of course, it is always better to have these options due to the higher resolution percentage compared to traditional FAQ pages. Customers will still be able to contact them through their email support system which is yet to prove itself in the customer service world. They do have a physical address in France mentioned earlier if you need to talk to them in person. Bitit.io is a solid website that offers a variety of payment options to people that want to get their hands on cryptocurrency without any complications from a standard trading platform. Here you will be able to purchase your crypto and get out from the website with your crypto directly deposited into your account without any issues. The only problem here is that they provide services for a very high fee; this can be countered though by their features and payment accessibility. Generally, the website is awesome and we encourage you guys to create an account with them and see for yourself on how easy it is to purchase BTC/crypto from them. 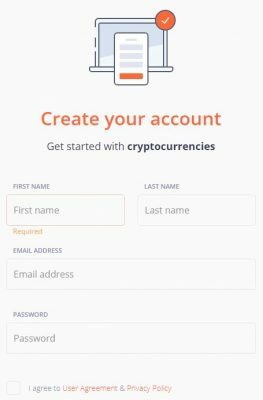 Do you already have an account with Bitit.io? If you have, what are your experiences with them? Please do share your thoughts in the comment section below.